Oh Lou, how we love you so. Not content with getting himself into bother and feeling the need to fake his death, he was panicking that his holiday fling would turn into something serious. Wannabe lothario Lou was desperate to get rid and get on a plane, but as luck had it, besotted Rochelle was there in the Turner garden! The scenes when she arrived and tried to snuggle up to him were hilarious and remind us exactly why we always want more Lou. Then there was his genius move to get his love/hate nemesis Sheila involved and pretend they’d been having an affair. Sheila was as hilarious as ever, slapping Lou, sharing insults with Rochelle. It was one liner after one liner, ending in a double dumping for Lou and absolute comedy gold for us. A great start to 2016! This week we really enjoyed the Rebecchis getting caught up in Steph and Belinda’s domestic drama. The aftermath to last year’s finale cliffhanger didn’t disappoint and we loved, and cringed, at desperate Sonya charging into the operating theatre and potentially putting Toadie’s recovery at risk. And of course, we loved the soapy drama of Toadie beginning to regain feeling in his feet – as well as his acceptance of Sonya’s mistake in a really heartwarming scene. Time and again they prove themselves the worthy modern day equivalents of the Kennedys. 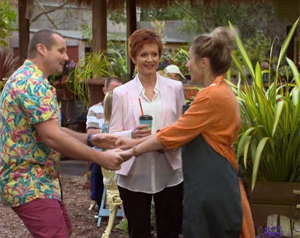 As well as this, we really liked seeing Sonya and Steph bond over Toadie despite all their differences in the past. We’ve really enjoyed having Belinda around and were glad she wasn’t turned into a cliché soap villain. Her final scene, lashing out after losing not only her job but Steph too, was great and will surely set up some future friction as Sonya is left worrying whether Steph still loves Toadie. The Paul storyline was a real highlight this week. After losing everything (how many times has that happened?) Terese offered him a place to stay at Number 22. It just feels right seeing Paul back there again, doesn’t it? And not to mention Terese and Paul scenes are always a joy to watch. Paul even had to lower himself to wearing Josh’s clothes while Terese tried to organise a welcome to the street party for Paul. We were slightly dubious that Amy would agree to go into business with Paul but her pep talk to him was no nonsense and we liked that. Speaking of no nonsense, Paul didn’t sugar coat his words to Daniel, giving him some really harsh home truths. Yikes. Great scenes from the ever brilliant Stefan Dennis! When Dennis Dimato rocked up again this week, it didn’t exactly fill us with joy. We had more than enough of his 2D cartoon gangster routine last year and hoped we’d put that plot to bed. Unfortunately he rocked up with a new suit, dodgy facial hair and more unconvincing police interviews. Why?! That was our main question. He’s not popular or charismatic and we were filled with even less enthusiasm that he saddled up to our firm favourite Paul with plans of investing in his business and sticking around – nooo! It’s the last thing we need. We can but hope there’s some sort of disaster on the horizon to get rid of him for good. It was the weakest cliffhanger of last year’s finale and was without a doubt the weakest plot this week, yes, it was Paige’s kidnap. Neighbours’ greatest strength is not these kind of gangster-y, hostage situation plots and sadly this was no exception. Despite their best attempts, the entire situation lacked any real drama. Lauren and Brad toddled around but lacked any real conviction in their concern and the less said about Mark’s reaction the better. We were sad to see Dimato make his official comeback (seriously, why?!) and we’re not looking forward to his continued presence on the show. The plot needs to shut down soon and Mark and Paige need to be moved out from these criminal dramas because it doesn’t bring out the best in the characters or the actors. Our highlight? Terese, quite rightly, showing little concern for Paige given how frosty and cruelly Paige has treated these past few months. Rochelle: I went home that night and thought: that’s it he’s the one, my OTP! Rochelle: My one true pairing. The Romeo to my Juliet, the Marc Antony to my Cleopatra! It was about time wasn’t it? The fall of Paul Robinson. That’s not to say he hasn’t had his own ups and downs this year – being tricked into believing he had cancer was a horrid moment of decline – but the way he behaves in general means he was bound to get his due at some point. It seems quite fitting that his fall from status happened literally too – bye bye penthouse apartment. That’s gotta hurt someone like Paul who prides himself from living on high! We really liked that Daniel admitted to leaking Paul’s wrong doings as having the betrayal come from within the Robinson family really made things worse. Paul has sworn he’ll be back to reclaim Lassiters – and let’s face it he’ll be back for revenge – and we can’t wait to see him fight back. What’s next for Paul? Where will he live? Where will he work? Who else is he going to make his enemy? There’s always something so watchable about Paul that we can count on him for some great stories. Bring on the next year of Paul! We can’t deny we’ve missed Lou in his prolonged absence this year. Now Tom Oliver’s hours have been cut back, we feared Lou was on his way out for good, so it was great to see him back with a bang at the end of this year – and even better, not simply back to support his family but with a story of his own! And in the grand tradition of Lou, it was a bit of a surreal and hilarious farce. Between the “drugs”, his suspected murderer and even the miserable Brennan and Lauren being dragged into the comedy, it was great fun to watch. Our highlight, however? It just had to be the memorial complete with with disbelieving reactions from the congregation, another much-love reference to Karl’s disastrous music career and of course, the brilliant and damning eulogy from Sheila. We looked forward to more of the classic Neighbours comedy in 2015 and hopefully Lou won’t be leaving in too much of a hurry. We’ve been loving all the guest characters in Neighbours lately. From devious, wild-haired Belinda, to suspicious Shay to the ever crafty Michelle. What we’ve enjoyed even more is seeing familiar faces from our other favourite Aussie show – Wentworth, not only Michelle but the Canning’s AirBnB guest Indianna. While it’s just for our own amusement we really like seeing these actresses and the guest characters add something extra when they’re meddling in the cosy lives of our Ramsay Street favourites. It’s been a good year for guest characters (just don’t mention Dimato) and we wouldn’t object to more Wentworth transfers in the future. Now we ordinarily love Christmas time in Neighbours and in recent years we’ve loved it all the more as the air dates between Australia and the UK grew gradually shorter, leading to the neighbours almost celebrating the event at the same time as us – a far cry from the days of Christmas in April! But is it just us or was there a real lack of Christmas spirit this year? We know filming schedules now prohibits the annual Christmas lights switch-on in Ramsay Street after dark but in many ways, it felt like the characters barely celebrated the day at all. Cannings aside, we saw little of the characters on Christmas morning and with those we did see, you’d be forgiven for thinking it was just another day. We hope next year there’s a greater sense of Christmas presence onscreen and dare we suggest a tree (complete with garish lights to switch on) in the middle of the Lassiter’s complex to combat the lack of lights on Ramsay Street? What a shame that Paige has become such a pain lately when she was such a strong character when she arrived. She only seemed to get worse leading up to the final week of the year, to the point of when she showed up at the police station demanding to see Mark (who was working) and whined at him we couldn’t believe our ears. Paige wanted to know why Mark thought she was being childish? HELLO. She’s been nothing but childish lately, being spoilt, rude and downright stupid. She fell for Michelle’s obvious tricks leading to a kidnap. It couldn’t have looked any more like a trap if it had had a neon sign! We’re getting pretty fed up of Paige and her immaturity and we seriously hope she gets a reality check in 2016 and grows up fast before it’s too late. Sheila: Could I please give the eulogy? I’ve dreamt of speaking at your funeral. Sheila taking great joy in the prospect of Lou’s demise. It seems the net is finally closing in on nasty Nick in what has proved to be one of the Neighbours’ darkest, edgiest plots in many years – and we’re loving it. It’s been fantastic to see powerful Paul as the victim, and see how this horrible diagnosis has caused him to re-evaluate his life, as well as cause he and Naomi to consider the burgeoning feelings they have for each other. Not only that but Georgia’s descent into “crazy” Nick obsessive has been fun to watch and a real change from the usual work and relationship storylines the character has had. But it seems the best is yet come with the fantastic cliffhanger at the end of the week where, after two months, unlikely sleuth Georgia uncovered Nick’s fake diagnosis mere scenes after Nick told Paul of his “miracle” recovery. We’re dying to see Georgia expose the truth and to see how Paul reacts! As well as seeing how poor Terese deals with her brother’s fraud. It might have been a little preposterous that the whole community gathered to give Paul their support and rally round to keep him as Mayor of Erinsborough considering the history his has with everyone. We’re sure everyone gathered has had their life made hell by Paul Robinson at one time or another but we couldn’t help but feel a little choked at the scene where everyone came together to support a sick Paul. Maybe seeing Paul so weak and downtrodden was another reason but we were moved. It’s not often we see him so choked up but when we do it’s powerful stuff. This week it was a small but nice touch having the Kennedys and the Rebecchis interacting so closely and feeling like a big extended family. Susan and Karl are lucky to have Nate now in their family unit but we’re always glad when Neighbours remembers that Toadie is practically their son. We enjoyed that they planned a day out (even if it was a disaster!) and was a great opportunity for some hilarious dialogue which the four actors relished as usual. It’s always heartwarming to see these two families join up for dinner and we hope we see even more of it as Sonya is back home where she belongs! We love Bailey and we totally empathise with his grief over the loss of his father but this week was a step too far even for us. Not only is Bailey acting like a serious brat but he actually shoved at shouted at Lou! Lovely cuddly granddad Lou! How can we forgive anyone for that? We do feel sorry for him, we really do but there’s only so much drinking and sulking on the Turner sofa we can watch. Not to mention his attempt to play cop when he looks like a baby George McFly was just plain cringeworthy! We hope this is as low as he’s going to stoop because we just can’t have anyone shout at Lou again!